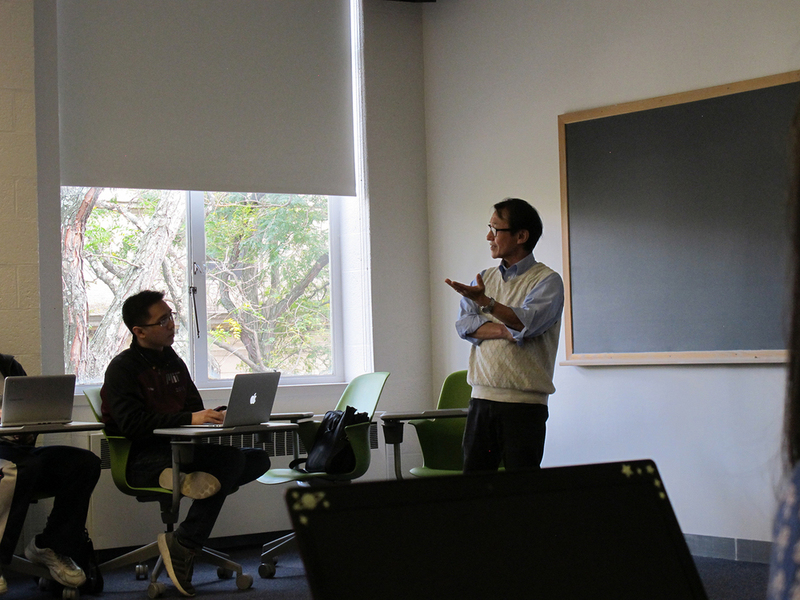 Miyagawa is Senior Associate Dean for Open Learning at MIT. He was on the original MIT committee that proposed OpenCourseWare, and was the Chair of the MIT OpenCourseWare Faculty Advisory Committee, 2010 - 2013. He is also Co-director of Visualizing Cultures (visualizingcultures.mit.edu) with the Pulitzer Prize-winning historian, John W. Dower. With John Dower, Andrew Gordon of Harvard, and Gennifer Weisenfeld of Duke, he created Visualizing Japan, a MOOC offered by edX for the first time in the fall of 2014 that has attracted over 9,000 learners world-wide. Visualizing Japan was a Finalist for the prestigious Japan Prize in 2015. He is also the producer of the multimedia program, StarFestival, which stars George Takei as the voice of the main character. StarFestival was awarded the Distinguished Award at the Multimedia Grandprix 2000 (Japan). Since 2014, he has served as the Project Professor and Director of Online Education for the University of Tokyo as a joint appointment with MIT. Miyagawa works on syntax, morphology, and Altaic and East Asian linguistics. He has recently been exploring both case marking and grammatical agreement across languages. In a joint work with Danfeng Wu and Masa Koizumi, he has developed an approach that derives Case Theory and the general notion of Case in favor of labeling of structures (Chomsky 2013). He has also developed the idea that grammatical agreement, broadly conceived, is universally present in human language. He is the author of Agreement Beyond Phi (2017, Linguistic Inquiry Monograph, MIT Press), Case, Argument Structure, and Word Order, Leading Linguists Series (Routledge, 2012), Why Agree? Why Move?, published as a Linguistic Inquiry Monograph by MIT Press (2010), along with over fifty articles on various linguistics topics. He has recently developed a theory of language evolution that hypothesizes that human language arose from the integration of two pre-existing systems in nature, one seen in birdsong, the other in primate alarm calls. His ideas are developed in jointly authored articles (Frontiers in Psychology, 2013, 2014, 2015). The Integration Hypothesis received mention in the journal Science and its news website (http://news.sciencemag.org/plants-animals/2013/02/tweet-screech-hey). Nature interviewed him, along with Noam Chomsky, for a program on primate communication and human language (Nature Podcast). BBC produced a 30-minute special inspired by his Integration Hypothesis of human language evolution. It aired in May 2015 on Radio 4, which has a multi-million listener base (http://www.bbc.co.uk/programmes/b05tz9jr). He has recently broadened the scope of research in looking at cave art as a marker of symbolic thinking that underlies language, a work jointly written with Cora Lesure and Vitor Nóbrega (Frontiers 2018). He received his B.A. from the International Christian University in 1975 and his Ph.D. from the University of Arizona in 1980. Twilight Chorus of birdsongs performed by humans, Brooklyn Botanical Garden, June 21, 2018. By Pete Wyer, inspired by the Integration Hypothesis. Write up in New York Times (3rd story down). Workshop on Case Theory and Labeling of Structures, to be held on Friday, August 4, 2018, at the UTokyo Komaba campus. In English. New article on language and evolution: "Cross-modality information transfer: A hypothesis about the relationship among prehistoric cave paintings, symbolic thinking, and the emergence of language," Frontiers 2018, with Cora Lesure and Vitor Nóbrega (Frontiers 2018). MIT News article, National Geographic article, AAAS EurekaAlert!, Boston Globe. Appointed Senior Associate Dean for Open Learning, MIT, 2018. News article. A very short and very fast video, "Where did language come from? ", by Jessica Sun, featuring the Integration Hypothesis. Youtube. 2018. Handbook of Japanese Linguistics: Syntax, (eds) M. Shibatani, S. Miyagawa, H. Noda. De Gruyter. October 2017. MIT Press publishes Agreement Beyond Phi, Linguistic Inquiry Monograph. MIT News story. March 17, 2017. Link to pre-copyedited Chapter 1. Review in Language by Elena Anagnostopoulou. Naked Scientists. BBC, Cambridge UK/ABC Australia. "Did the cavemen have names?" BBC Radio 4 features Integration Hypothesis (about 17 minutes into the program). What the Songbird Said. "What the songbird said" wins the 2015 AAAS Kavli science journalism award. Video of the producers about the production of the show. Nature Podcast interview with Chomsky, Miyagawa, etc. (17 minutes into the program). Real Life Dr. Dolittles. "The precedence of syntax in the rapid emergence of human language in evolution as defined by the integration hypothesis." Frontiers in Psychology. 18 March 2015 (with Vitor A. Nóbrega). Article. "The integration hypothesis of human language evolution and the nature of contemporary languages," Frontiers in Psychology. June 2014 (with S. Ojima, R. Berwick, K. Okanoya). MIT News. Science News. LiveScience. "The emergence of hierarchical structure in human language," Frontiers in Psychology. February 2013 (with R. Berwick, K. Okanoya). Science News. MIT News. Case, Argument Structure, and Word Order. Leading Linguists Series.Routledge. 2012. Review by Stella Markantonatou in Linguist. YouTube Video of Chapter 10. Why Agree? Why Move? Unifying Agreement-based and Discourse Configurational Languages. 2010, MIT Press, Linguistic Inquiry Monograph 54. Review by Anders Holmberg in Language. Link to The MIT Press. Link to MIT News. Link to Google Books. In a Q&A, course co-founder Professor Shigeru Miyagawa discusses his unique online course and its impact on digital education. 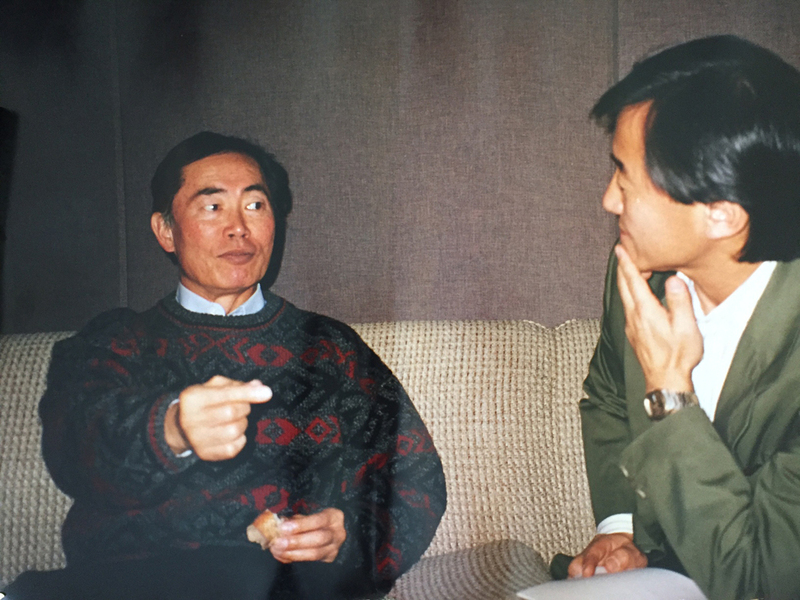 George Takei, the voice of "Star Festival"
Agreement Beyond Phi, Linguistic Inquiry Monograph, MIT Press. March 2017. Link to pre-copyedited Chapter 1. Case, Argument Structure, and Word Order. Leading Linguists Series. Routledge. 2012. Review by Stella Markantonatou in Linguist. YouTube Video of Chapter 10. Historical Development of the Accusative Case Marking in Japanese as Seen in Classical Literary Texts, special issue of Journal of Japanese Linguistics, vol. 19, 105 pp., 2003 (with Fusae Ekida). Link to manuscript. Structure and Case Marking in Japanese, Academic Press, 259 pp., 1989. Studies in Japanese Language Use: Papers in Linguistics Monograph Series, Alberta, Canada, co-edited with Chisato Kitagawa, 1984. Complex Verbs and the Lexicon, Coyote Papers, Vol. I, University of Arizona Linguistics Circle, 1981 (1980 University of Arizona doctoral dissertation). "Deriving Case Theory," Ms. (Shigeru Miyagawa, Danfeng Wu, Masatoshi Koizumi). 2018. "Cross-modality information transfer: A hypothesis about the relationship among prehistoric cave paintings, symbolic thinking, and the emergence of language," Frontiers 2018, with Cora Lesure and Vitor Nóbrega (Frontiers 2018). "Topicalization," Gengo Kenkyu (Linguistic Research). 152:1-29. 2017. Article. "Integration hypothesis: A parallel model of language development in evolution," to appear in Evolution of the Brain, Cognition, and Emotion in Vertebrates, edited by Shigeru Watanabe, Michel Hofman and Toru Shimizu, Springer. In press. Manuscript. "Numeral quantifiers," In Masayoshi Shibatani, Shigeru Miyagawa, and Hisashi Noda, eds., Mouton Handbook of Japanese Linguistics, de Gruyter. October 2017. Manuscript. "The syntax of ditransitives," Oxford Research Encyclopedia of Linguistics. 2017. DOI:10.1093/acrefore/9780199384655.013.186 (With Heidi Harley). "Second-Language Learning Effects on Automaticity of Speech Processing of Japanese Phonetic Contrasts:An MEG study." Brain Research 1652: 111-118. Fall 2016. Hisagi, M., Shafer, V. L., Miyagawa, S., Kotek, H., Sugawara, A., and Pantazis, D. Article. "OCW: How it began," in a special Bridge volume on OpenCourseWare, National Academy of Engineering. Fall 2016, 5-11. Article. "The precedence of syntax in the rapid emergence of human language in evolution as defined by the integration hypothesis. Frontiers in Psychology. 18 March 2015 (with Vitor A. Nóbrega). Article. "The integration hypothesis of human language evolution and the nature of contemporary languages," Frontiers in Psychology. June 2014 (with S. Ojima, R. Berwick, K. Okanoya). "Minimal variation," Ms., July 2012/2014. "Strong uniformity and ga/no conversion," English Linguistics 30:1-24, the journal of the English Linguistics Society of Japan. Article. "The emergence of hierarchical structure in human language." Front. Psychol. 4:71. doi: 10.3389/fpsyg.2013.00071. 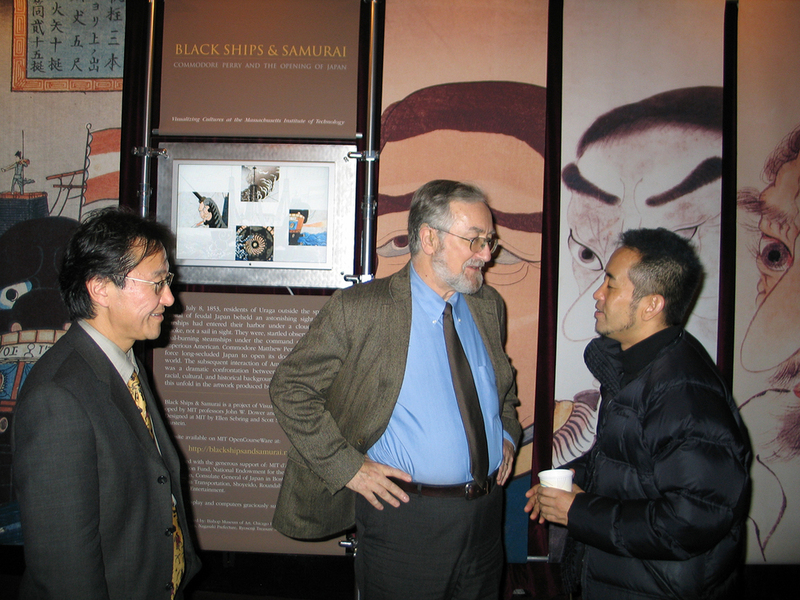 February 2013 (with R. Berwick and Kazuo Okanoya). "Agreements that occur mainly in the main clause." Main Clause Phenomena: New Horizons, Lobke Aelbrecht, Liliane Haegeman, Rachel Nye (eds), 79-111. John Benjamins. 2012. Article. "Genitive of depedent tense in Japanese and its correlation to genitive of negation in Slavic." In Case, Argument Structure, and Word Order, Leading Linguists Series, Routledge. 2012. Link to manuscript. "Blocking and causatives: unexpected competition across derivations." In Case, Argument Structure, and Word Order, Leading Linguists Series, Routledge. 2012. Link to manuscript. "The Old Japanese accusative revisited: Realizing all the universal options." In Case, Argument Structure, and Word Order, Leading Linguists Series, Routledge. 2012. Ms. date: July 2011. Link to manuscript. "Telicity, numeral quantifier stranding, and quantifier scope." In Case, Argument Structure, and Word Order, Leading Linguists Series, Routledge. 2012. Ms. date: July 2011. Link to manuscript. 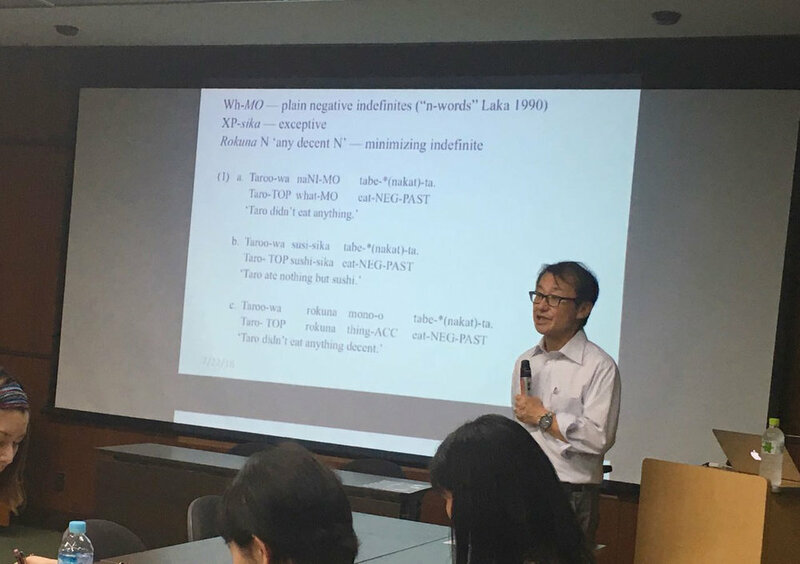 "Nominalization and argument structure: evidence for the dual-base analysis of ditransitive constructions in Japanese." In Case, Argument Structure, and Word Order, Leading Linguists Series, Routledge. 2012. Ms. date: November 2010. Link to manuscript. "Optionality," The Oxford Handbook of Linguistic Minimalism, ed. Cedrix Boeckx, Oxford UP (completed in November 2008). 2011, pp. 354-376. Article. "Genitive subjects in Altaic and Specification of Phase," in a special Lingua volume edited by Jaklin Kornfilt and John Whitman. The date of the ms. is 6/28/09. 2011 Vol 121, pp. 1265-1282. Article. "Genitive Subjects in Altaic," 2008. In: Ulutas, S., Boeckx, C. (Eds. ), Proceedings of the Workshop on Altaic Formal Linguistics (WAFL4), MITWPL 56, Cambridge, Mass., pp. 181-198.MITWPL. Link to manuscript. "Locality in Syntax and Floated Numeral Quantifiers," 2007, Linguistic Inquiry 38:645-670 (with Koji Arikawa). Article. "On the ‘undoing’ nature of scrambling: a response to Bošković,” 2006, Linguistic Inquiry 37:607-624. Article. "Moving to the edge." Proceedings of the KALS-KASELL International Conference on English and Linguistics, pp. 3-18. Pusan National University, Busan, Korea. June 2006. Article. Miyagawa, Shigeru. 2007 (written in 2004/2005). Unifying agreement and agreementless languages. In Meltem Kelepir and Balkiz Öztürk, eds., MIT Working Papers in Linguistics 54: Proceedings of the Workshop on Altaic Formal Linguistics II , 47-66. Cambridge, MA: MITWPL. Article. "EPP and Semantically Vacuous Scrambling," Joachim Sabel and Mamoru Saito, eds., The Free Word Order Phenomenon: Its Syntactic Sources and Diversity, 181-220. Mouton de Gruyter. 2005. Article. "On the EPP," Martha McGinnis and Norvin Richards, eds., Perspective on Phases, 201-236. MIT Working Papers in Linguistics, 2005. Link to manuscript. "On Weak Islands," 2004 MIT manuscript. Link to manuscript. "A-chain Maturation Re-examined: Why Japanese Children Perform Better on "Full" Unaccusatives than on Passives," Andrea Gualmini, et al, eds., MIT Working Papers on Linguistics, to appear in Fall 2004 (with Nanako Machida and Ken Wexler). Link to manuscript. "Decomposing Ditransitive Verbs," Proceedings of SICGG, 101-120. Summer 2004 (with Yeun-Jin Jung). Article. "Wh-in-situ and Scrambling in the Context of Comparative Altaic Syntax," Proceedings of the First Workshop on Altaic Formal Linguistics, MIT Working Papers in Linguistics. Spring 2004. Link to article. "Argument Structure and Ditransitive Verbs in Japanese," Journal of East Asian Linguistics, 1-38. 2004 (with Takae Tsujioka). Article. "A-movement Scrambling and Options Without Optionality," Word Order and Scrambling, 177-200. Simin Karimi, ed., Blackwell Publishers, 2003. Link to manuscript. "MIT’s OpenCourseWare Initiative: A Case Study in Institutional Decision-Making," Academe Vol.88 No6, 23-27 (Journal of AAUP), with Steve Lerman. 2002. Link to article. "Personal Media," Technos Quarterly, 2002. Link to article. "Causatives," Natsuko Tsujimura, ed., The Handbook of Japanese Linguistics, Blackwell, pp. 236-268, 2001. "EPP, Scrambling, and Wh-in-situ," Ken Hale: A Life in Language. Michael Kenstowicz, ed., MIT Press, 2001, pp. 293-338. Link to article. "Attachment and Japanese Relative Clause," Journal of Language Processing (with Edson Miyamoto, Ted Gibson, and Takako Aikawa) 2000. "Light Verb Make and the Notion of Cause," Festrischft for Kazuko Inoue, 2000. "Case dropping and unaccusatives in Japanese acquisition," Proceedings of the BU Conference on Language Acquisition (with Edson Miyamoto, Ken Wexler, and Takako Aikawa) 1999. Article. "(S)ase as an Elsewhere Causative and the Syntactic Nature of Words," Journal of Japanese Linguistics, 16: 67 - 101. 1998 (accepted in 1995). Article. "Against Optional Scrambling," Linguistic Inquiry 28.1, Winter 1997, pp. 1-25. Article. "Word Order Restrictions and Nonconfigurationality," Proceedings of Formal Approaches to Japanese Linguistics 2, MITWPL, Department of Linguistics and Philosophy, MIT, 1996, pp. 117-142. Link to article. "JP NET: Building a Virtual Global Community of Japanese Specialists," Proceedings of the Association of Teachers of Japanese Conference at Georgetown, Association of Teachers of Japanese, Middlebury College, 1995 (with Tomoko Graham and Anne LaVin). "Scrambling as an Obligatory Movement," Proceedings of the Nanzan Conference on Japanese Linguistics and Language Teaching, 1995. "(S)ase as an Elsewhere Causative," Program of the Conference on Theoretical Linguistics and Japanese Language Teaching, Tsuda University, 1994, pp. 61-76. "Case, Agreement, and Ga/No Conversion in Japanese," Proceedings of the San Diego State University Japanese/Korean Linguistic Conference, 1993, pp. 221-235. "LF Case-checking and Minimal Link Condition," MIT Working Papers in Linguistics, 1993, pp. 213-254. Link to article. "Transitivity and Case Marking" (review article of Wesley Jacobsenís The Transitive Structure of Events in Japanese), Journal of Association of Teachers of Japanese, 1993. "Case Realization and Scrambling," Ms., Ohio State University, 1991. Manuscript. "Kara and Node: Extending the Study Based on Phenomenal and Structural Knowledge." Proceedings of the Middlebury Conference on Japanese Linguistics and Language Teaching, 1991. "The Logic of kara and node," in C. Georgepolis and R. Ishihara, eds., Interdisciplinary Approach to Language: In Honor of S.-Y. Kuroda. Reidel, 1991. "Light Verbs and the Ergative Hypothesis," Linguistic Inquiry 20.4, 1989, pp. 659-668. "NP Movement in Japanese." Ms. Hajime Hoji (USC), Shigeru Miyagawa (Ohio State), Hiroaki Tada. 1989 (USC). Link to manuscript. "Predication and Numeral Quantifier," in W. Poser, ed., Proceedings of the Second Japanese Syntax Workshop, pp. 157-192, Center for the Study of Language and Information, Stanford University, 1988. "Shiekikei to Goi-bumon," (Causative forms and the Lexicon), in S. Kuno and M. Shibatani, eds., Nihongogaku no Shintenkai (New directions in Japanese Linguistics), Kuroshio Shuppan, 1988. "Unaccusative Verbs in Japanese," Proceedings of the Eastern States Conference on Linguistics 4, 1988, pp. 199-220. "Theme Subjects and Numeral Quantifiers," in W. Tawa and N. Nakayama, eds., pp. 132-167, Proceedings of the Japanese Syntax Workshop, Connecticut College, 1987. "Lexical Categories in Japanese," Lingua 73, 1987, pp. 29-51. "LF Affix Raising in Japanese," Linguistic Inquiry 18, 1987, pp. 362-367. Article. "Restructuring in Japanese," in T. Imai and M. Saito, eds., Issues in Japanese Linguistics, Foris Publications, 1987, pp 273-300. "Wh Phrase and Wa," in John Hinds et al, eds., Perspectives on Topicalization: Studies on the Japanese Wa, Benjamin Press, 1987, pp. 185-217. "Historical Development of the Accusative Case in Japanese (with Setsuko Matsunaga), " Journal of Asian Culture, UCLA Vol. 8, 1986, pp. 87-101. "Verb Classes in English and Japanese: A Case Study in the Interaction of Syntax, Morphology, and Semantics," (with Naoki Fukui and Carol Tenney), Lexicon Project Working Papers 7, Center for Cognitive Science, MIT, 1985, pp. 87-101. "Blocking and Japanese Causatives," Lingua 64, 1984, pp. 177-207. Article. "Pragmatics of Causation in Japanese," Studies in Japanese Language Use, S. Miyagawa and C. Kitagawa, eds., 1984, pp. 147-184. "Requesting in Japanese," Journal of the Association of Teachers of Japanese 17, 1984, pp. 123-143. "Self-Sustaining Dialect: A Model for Second Language Teaching (with Galal Walker)," Proceedings of the XIIIth International Congress of Linguists, S. Hattori, ed., Tokyo, 1983, pp. 1136-1138. "Paradigmatic Structures and Word Formation," Coyote Papers 2, University of Arizona Linguistics Circle, 1982, pp. 145-162. MIT News - February 23, 2012 "Unique languages, universal patterns." To the chagrin of anyone who knows one of these languages but not the other, English and Japanese appear to be frustratingly different tongues governed by drastically different rules.